Phil Witte BSc, BVSc, CertAVP(GSAS), DSAS(Orth), MRCVS. Phil qualified from Bristol University Veterinary School in 2005 and worked in mixed practice in Herefordshire for two years, followed by a year in South Africa working with buffalo. On his return to the UK, he took a position as Orthopaedic Intern at SCVS followed by a three-year orthopaedic residency. 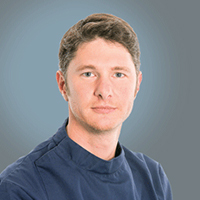 He completed an RCVS certificate in advanced veterinary practice in September 2013 and passed his RCVS Diploma in Veterinary Orthopaedics in 2018. Witte, P.G., Scott, H.W. (2012) Tibial plateau levelling osteotomy for small breed dogs with high tibial plateau angles using the Fixin locking plate system. Clinical Research Abstract. British Small Animal Veterinary Association, Birmingham, UK. April 2012. Witte, P.G., Bush, M.A., Scott, H.W. (2012) Hybrid external skeletal fixation to stabilise distal tibial fractures in cats. Clinical Research Abstract. British Veterinary Orthopaedics Association. York, UK. November 2012. Witte P.G. (2017) Feline Trauma Management. London Vet Show. London, UK. November 2017. Dean B, Witte P.G (2016) Biaxial plating by minimally invasive percutaneous osteosynthesis of comminuted humeral fractures in two cats. Poster presentation. 18th ESVOT Conference 2016.